Most registry cleaner software promises to speed up your system which is not really possible. These cleaners may also come with unwanted additions such as adware or spyware. Our System Registry Repair allows you to do some basic cleanup and repair in a number of categories where changes might positively affect user experience, for instance helping Windows find misplaced Help files. 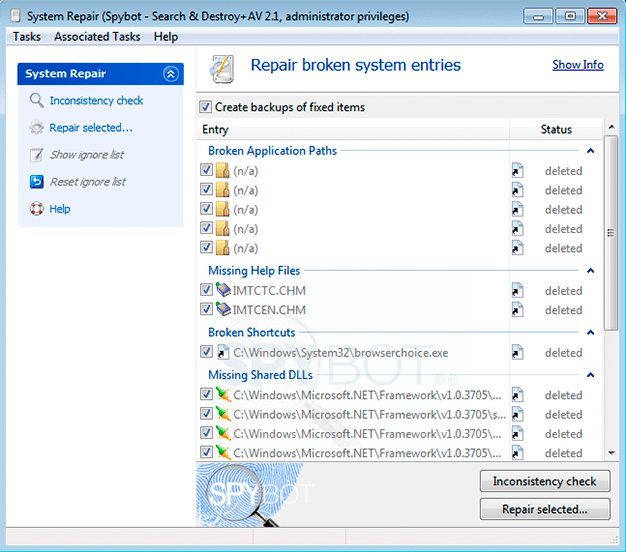 It can either delete or repair broken entries by offering you you the options, for example, of locating or searching for files that have been moved. In general, we recommend that you do not use Registry Cleaners, Optimizers or Defragmentation utilities unless you are an experienced user.